So would these still be a good wheel considering their age? Hugger Fan Jets they are either Labeda or Vanguard manufactured. I have two sets. A-Town has a variety of Fan Jets. They are still popular. "Hugger" and "Fanjet" are 2 different wheels....the wheels in that pic are Fanjets....and yes they will still be good you can either sand them to break the glaze (if you know how) or send them to Dan Beaver and have them cut a little. So how does one go about sanding the glaze off. I am assuming you would use a fine grit paper or maybe even a wet sand? I might be willing to try that. The glaze would not come off with a few good hockey stops hehe? MUCH easier to let Dan Beaver deal with your wheels.. regrove... and youll be set..
Hehe. Ok. Just thought I would ask. i do it all the time with great results....but yes Dan can get them back to like new again...but then i turn around and sand the lines off for better grip! I did a search for Dan and could not find him. How do I contact him? So I was looking for some help on identifying these wheels? they are pink, not sure the camera shows that. thanks, its been so long since I have put on my roller skates, I might have to give these a lath job and try them out again. How do these whells rank any ways? fast, slow, grippy, training wheels, session wheels give away wheels? so are the mark IV's something discontinued now? you showed a set in a thread i started about finding 57mm speed wheels and i've been looking for some. am i wasting my time? has anyone heard of gyro's? 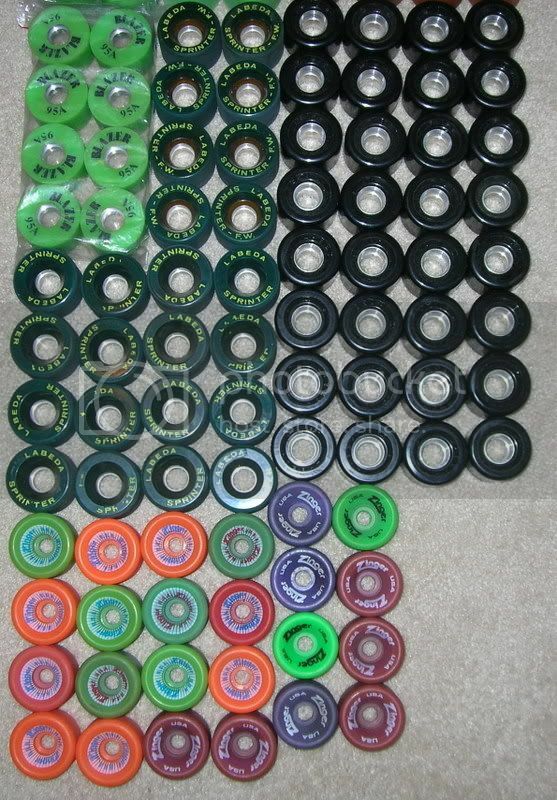 i was skateboarding more before i started roller skating again and they were a skateboard brand that switched to rollerskate wheels about when i made my switch, around 1980 or so. they were my favorite wheel, but when i look it up now all i find is some kind of inline wheel or a dance wheel of some kind. aw man... the search continues. My original Fan Jets that I still own, the package read Vanguard Jumbo Hugger Fan Jets and they are orange. They might not be made by Hugger but they did have Hugger on the wrapper when I opened them. 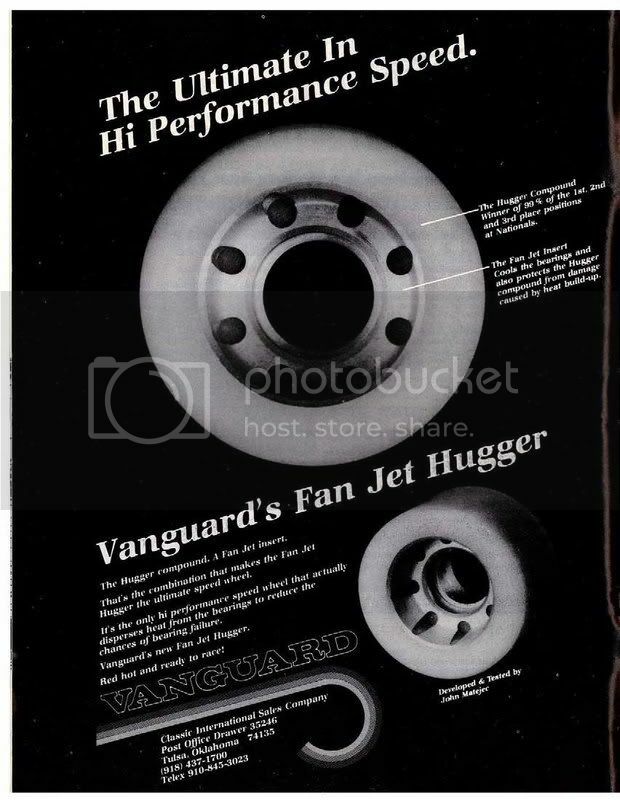 The compound put out by Vanguard was called "Hugger" and yes they also made Hugger Fanjets. Im not sure why bazzman doesnt know this???????? Hi all. 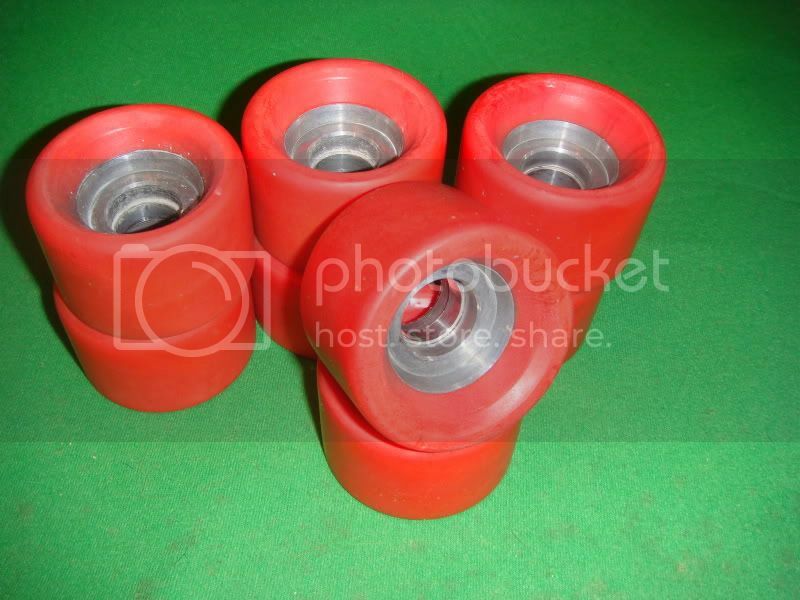 I had a pair of Reidell skates back in the early 80's and they came with these wheels that I believe were called White Lightings?? They were white, very small in diameter, hard as can be and super wide. They had metal "deep dish" hubs. Has any one seen wheels like these? I wasn't sure if I had the only set cause in my 20+ years of skating I have never seen any more.